Most companies buy Janitorial Supplies and office supplies from two different companies because they think Janitorial Supply specialists have a greater selection or better prices than on office supply store. ZumaOffice.com is much more than and online office supply store, and offers everything you need for the office including the top janitorial supply brands at low prices that will make you smile! Zuma has Janitorial Supplies and cleaning products with free shipping. While many janitorial supplies companies have what appear to be low prices, they charge shipping for most orders, so when comparing the total cost of your order, Zuma saves you money. We offer free shipping for orders over $75, and when you can combine janitorial supplies and office supplies on one order, it’s easy to get free shipping on every order. And cleaning supplies ship fast too - in 1 to 2 business days! Think of the time savings you’ll have consolidating vendors, ordering once, paying once and receiving your order once. Janitorial supply companies are also known for outdated hard to search websites to order, (or no website at all) while ZumaOffice.com’s website is easy to search with features like favorites lists and order tracking at your fingertips. Bulk Janitorial Supplies and cleaning products at wholesale prices. Have bulk janitorial supplies needs for a large project or stocking up a new location? Contact Zuma at 877-473-4097 or email us at [email protected], and let us know what you need. Chances are we can quote janitorial supplies at wholesale prices for large quantities, and provide incredibly fast shipping and free delivery. Where you buy paper towels and toilet paper can make a difference? 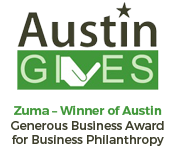 Zuma was founded on the business principles of conscious capitalism, and as part of our model we give back over half our profits to great charities. So yes, buying Purell hand sanitizer, Clorox cleaning wipes or Rubbermaid cleaning carts from Zuma does make a difference. The more you support Zuma, the greater our donations can be to great organizations that research cancer, help children and feed the hungry. Next time you need discount trash can liners or soap dispensers for your small business, think Zuma for janitorial supplies and do good work while saving money for your business.